As Battersea estate agents, we are often asked by people thinking of moving here what the place has to offer. They know about all the regeneration work taking place around Nine Elms and the Battersea Power Station, and they might know that Battersea Park is becoming the most important IT centre in northern Europe. But what is there to do at night? If they are out to enjoy an evening with friends, what will they find? So, we thought we’d better review some of the drinking and eating establishments in the Battersea area. Our first thought was not the old-style traditional spit and sawdust pubs, but something special. It didn’t take us long to realise that those traditional watering holes would be hard to find. Everything in Battersea right now is special. Of course, where you go will depend to a great extent on whether you’re alone or with someone. Good company is key for an enjoyable evening. The King of Ladies Man on Battersea Rise, for example, may not (though, to some, it may) be the place that springs to mind when you’re looking for a quiet pint on the way home. For a friends’ night on the town, on the other hand, it has few rivals. They have some splendid cocktails, otherwise known as 'Dirty Little Specials'. Pair a cocktail with one of the melt-in-the-mouth cheesy snacks on offer and you'll be happy as a sandboy/girl. Also on Battersea Rise, is the Humble Grape. This wine bar and merchant describes its mission as being 'to make wine socially inclusive and approachable by anyone.' There is an excellent range of mainly organic, biodynamic wines, with an ambience that is far from prissy. Give it a go – chances are, you’ll love it. Lost & Co seems to have been around forever, and yet it retains its fabulous freshness. Cocktails, craft beers, and here, once again, is a place to try wines that you may not have encountered elsewhere. There are pizzas, burgers, and salads and superb coffee. 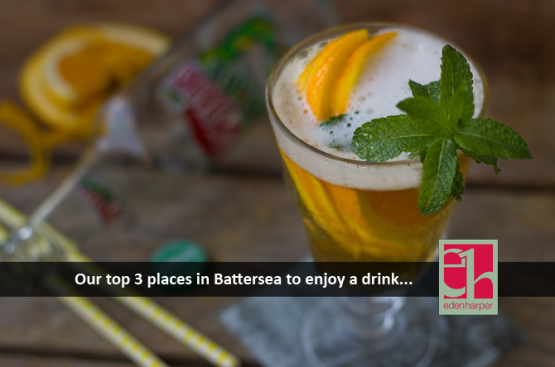 That’s only three of the places you’ll find to enjoy with friends in Battersea – we could make this post four times as long as it is, and still not have covered the ground. There’s a heck of a lot going on in Battersea, and the evening hangouts reflect it. If you are thinking of making a home in this happening corner of London, and you need a Battersea estate agent to help you find exactly the place for you, call us. We know Battersea, and we love it. We’ll help you love it, too.